My son is a man of many talents. When he’s not making a music video about befriending the grim reaper, or jumping off a cliff into the Clackams River with his new bride, or figuring out how to install a screen door, or remastering his original music for Marmoset, he makes a mean bowl of vegan mashed potatoes. And when he comes up with something, whether it’s behind the camera or in the kitchen, it’s nearly always so original that I can’t even wish I had thought of it myself, because I just know I never would have. Like his sculpture professor once said to me at one of his art shows in college, “You start out wondering how in the world Mike is going to get his idea to work. You just don’t see how. But then he really does make it work and it’s amazing.” It was extra fun for me to hear his professor describe a creative dynamic I’d lived with since he was four. It’s this very quality that makes all his projects so inspired and, in the case of food, uniquely delicious. Like these mashed potatoes. The last night of my stay in Portland for the spectacular wedding weekend, it was just the 3 of us, and we decided to have a potato night. Kelly made some yummy sweet potato French fries with horseradish ketchup. When Mike offered to make his special mashed potatoes, her eyes lit up and she smiled she assured me enthusiastically that I would like them. To go with the starches, we steamed up some broccoli and put it on a bed or chopped red cabbage—“for color” as Kelly so wisely chose. She also made a nice avocado dressing to put on the top of the purple and green veggies. And Mike and I scattered some black beans over everything, just for food measure. 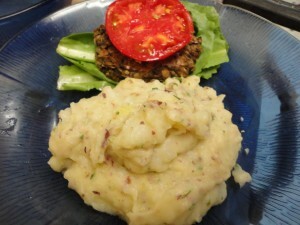 But the real star of our potato plate were Mike’s easy vegan mashed potatoes. The secret ingredient? Fresh lemon juice. (I never, ever would have thought of this myself.) And lots of garlic. 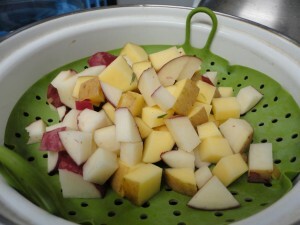 Mike cubes but doesn’t peel the potatoes to steam them, then throws them in the food processor with lots of fresh garlic, lemon juice, almond milk, and some Bragg’s. The night I was there he left the Bragg’s out in deference to me. Kelly decided they were just as good without it. But I’m thinking Mike will put it back in when I’m not around to police the sodium. He also happened to forget the rosemary he usually adds (they have a large bush out in their yard), but that didn’t stop us from going back for seconds. I’m really lucky my son and his wife walk the plant-based whole food talk with me, and eat healthy vegan food. I always know when I visit them the kitchen will be stocked with things I can make a meal out of. 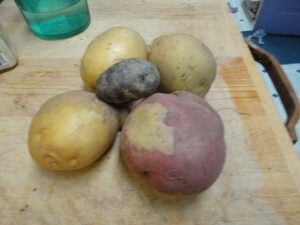 And best of all, we really do enjoy simple meals like our potato night. Or veggie taco night. It’s nice to have company eating healthy. The combined effect of the bits of colorful potato skin, lemon zest, and fresh rosemary bits made these mashed beauties into confetti potatoes, which I thoroughly enjoyed. My “recipe” remake at home made two good sized servings, but I confess I ate them both. Steam the potatoes until they are fork tender, maybe about 10- 15 minutes. 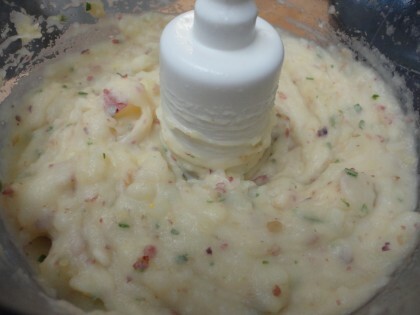 Meanwhile, put the garlic cloves in the food processor and chop them up a bit (otherwise you might end up with whole garlic clove in your serving of mashed potatoes). When the potatoes are done, add them and everything else to the food processor bowl and whir them up to your desired consistency. Scoop out, plate up, and enjoy!! Notes: At the very end, I couldn’t resist adding a few fresh leaves of lemon thyme I’d picked earlier that day to go in a version of Susan’s Savory Lentil-Mushroom Burgers (one of which is hiding under the tomato slice next to the potatoes in the photo above). Her burgers went great with these mashed potatoes. You can use other fresh herbs that appeal to you. Sage sounds like a good idea to me, especially lemon sage. Rosemary really goes well with potatoes, though, so if you have it, I’d recommend using it. Great recipe Maria! I have written it down to make! I hope to cook much more now that the fall is here! Thank you! Don’t the potatoes get gummy in the food processor?? Hi Dmitri, and thanks for your comment. I suppose that may be a matter of personal taste, but no, these mashed potatoes were not gummy. I think it may be steaming them than helps prevent that, but I’m just guessing. You could also mash them by hand or with a food mixer, if you’d prefer. Hope that helps. Potato night sounds awesome! I just got some broccoli from my CSA and was wondering what I was going to do with it… So I’ll whip up these potatoes and steam up the broccoli and throw in a couple other things. Thanks (to you and your son) for the great idea and post! Maria, these mashed potatoes sound incredible! Tell Mike he’s a genius–my mouth was watering just reading about them. I can’t eat potatoes too often (I think I’m sensitive to nightshades), but the next time I have them, this is the recipe I’ll be making! I might even try it with cassava; I bet it would be equally delicious. Hi Lee!! Thanks so much–I’ll be sure to pass what you said along to Mike–he’ll be thrilled. 🙂 Your version with Cassava sounds intriguing. I’ve never had it before, but I read it can be used like potatoes. That’s cool! Those sound really good! I am sharing this recipe with the potato and garlic lovers I know! I’m very new to all of this (I’ve been doing it for 4 weeks now-I just did the McDougall 10 day program), and love all the great recipe ideas. I’m curious as to what the green thing is that you use to steam your potato. I’d like to get one! Next post: Will My Real Old Self Please Stand Up?